This website tells you about Kiyamachi,one of the oldest entertainment districts in Kyoto. You can learn about its interesting history. You can know about many eating and drinking places from famous Japanese cuisine restaurants to popular bars. After learning, all you have to do is COME and ENJOY YOURSELF!! 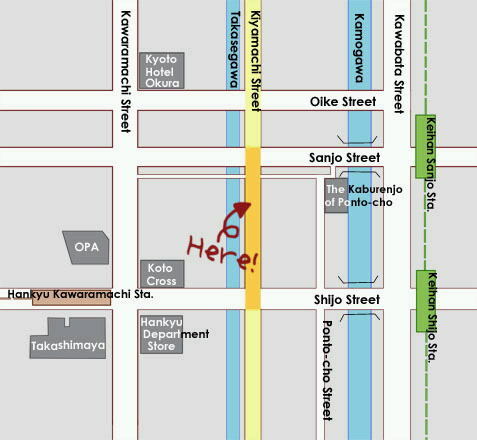 How to get to Kiyamachi? Kyoto city bus No.4, 17, or 205. Get off at Kawaramachi station and Walk 1 minute to the West. Get off at Sanjo station. Get off at Shijo station.